In the 2013-2014 National Basketball Association (NBA) season, the Los Angeles Laker’s Kobe Bryant earned $30.4 million. That same year Dirk Nowitzki, Amar’e Stoudemire, Joe Johnson, Carmello Anthony, and Dwight Howard earned $22.2, $21.7, $21.4, $21.3, and $20.5 million respectively (8). The average salary of an NBA player for the 2013-2014 season was $5.1 million which was higher than the average salary for a National Football League, National Hockey League, or Major League Baseball player (3). What’s more, 52 (9.1%) of NBA players earned between $10 million and $19 million during the 2013-2014 season (8). The NBA players’ salary cap was instituted in the 1984-1985 season. That year the salary cap was $3.6 million and the average player salary was $300,000 (5). In 1984-1985 eleven NBA players made $1 million or more with the Lakers’ Earvin “Magic” Johnson topping the list with $2.5 million (1). In 2013, 377 (66.2%) of NBA players earned $1 million or more. For the 2012-2013 season, the NBA salary cap was $58 million and the average NBA player salary was $5.1 million. Again, in the 1984-1985 season, Magic Johnson’s $2.5 million was the highest salary in the NBA. However, in the 2013-2014 the highest salary was Los Angeles Lakers’ Kobe Bryant who made $30.4 million. The escalation of NBA player salaries has not only been explosive, but it has also created a large earnings gap between players. Kobe Bryant’s 2013-2014 $30.4 million salary considerably dwarfed his Lakers teammate Ryan Kelly’s $490,000. There has been considerable attention paid to the escalation of NBA player salaries (24). Sprow (25) seemed to think that there is a salary bubble in the NBA and that salaries will decrease or come “tumbling down” very soon. There may be evidence for this. From the 1984-1985 to 2006-2007, the average NBA player salary continued to increase. However, from 2007-2008 until 2012-2013, NBA salaries leveled off (3, 13). What’s more intriguing is the fact that some question whether NBA players are overpaid. Nathan (22) indicated that overpayment in the NBA is problematic. Statistically some players are overpaid based on poor or sub-par performance. These players are highly sought after because they are proficient in one aspect of their game such as three point shooting or they may be a defensive force. However, these same specialized players may be a major liability in other areas i.e., the three point shooter may be a poor defender and the defensive force may be a poor free throw shooter. Whatever the issue, overpayment in the NBA is a concern. The reason for payment is to fairly compensate a player for his play. However, in the NBA it seems as if compensation is a reward for past performance and anticipated or expected future performance. However, past performance and expected performance may not be good indicators of fair compensation. NBA owners and general managers often over spend for a player that they feel will meet and immediate need. This is very myopic. The purpose of this investigation was to identify the variables that are most likely to contribute to NBA player salaries. There is a dearth of empirical literature regarding the topic of NBA player salary determinants. Whereas there have been some articles written on NBA player salary discrimination, the lack of empirical evidence as it relates to player performance and its impact on player salary have been virtually non-existent. This investigation serves to contribute to the paucity of empirical literature regarding NBA player salaries. Wage fund theory was chosen to guide this study. According to this theory, wages are determined by the amount of capital available to pay workers. As capital increases so do worker raises. This theory has a direct correlation to the NBA salary cap. The salary cap is comprised of Basketball Related Income (BRI) which consists of revenue generated from ticket sales, national and local broadcast deals, in arena concession sales, signage, stadium naming rights, and merchandise sales. In theory, as components of the BRI increase so does the salary cap. As an example, the NBA recently negotiated a lucrative national broadcast deal with ESPN and Turner Network that will pay the NBA approximately $2.6 billion annually beginning in the 2016-2017 season. This is a 300% increase over the previous broadcast deal. Moreover, NBA teams can expect an increase in the salary cap from $63 million to $88 million. This represents a 39% salary cap increase (6). Unlike coaches who are primarily hired and paid based on the single metric of wins (4, 10), players are hired and paid based on individual performance in respect to numerous on-the-court metrics i.e., points per game, shooting percentage, rebounds, steals, personal fouls, turnovers, blocked shots, and assists. Furthermore, it is the hope of ownership that a player’s outputs contribute to the success of the team which is manifested in wins. Players are hired based on team needs and a player’s individual strengths. For example, a team may need a player that can shoot well, hence they sign or draft a player because he is an excellent three point shooter. In addition, owners understand that they must select a group of players that will enhance their chances of winning. Each player’s strengths and weaknesses must be evaluated in order to assemble the best team possible. To this end, player selection becomes a very laborious, calculated and data driven process for ownership. What’s more, assembling a team is made more difficult due to financial constraints. In the case of the NBA, the primary financial constraint is the salary cap. Based on the literature and various NBA salary databases, it was hypothesized that the components of scoring i.e., points per game, free throw percentage, field goal percentage, and three point percentage would be the most significant factors in determining a player’s salary. The dependent variable in this study was the NBA players’ 2013-2014 salaries. The independent variables for this study were players’ field goal percentage, three point percentage, free throw percentage, rebounds per game, assists per game, turnovers per game, steals per game, blocked shots per game, personal fouls per game, and points per game. There has been a paucity of studies conducted on determinants of salary in professional sport and the NBA in particular. Most studies have focused on the imbalance of player salaries as it relates to racial discrimination for example. The following is a summary of studies conducted on professional athletes’ salaries. Berri, Brook, and Schmidt (2) asked the question does a NBA player need to score in order to receive lucrative contract deals. Their analysis of NBA player compensation led them to conclude that a player can be handsomely compensated just by focusing on scoring. However, the researchers also noted that scoring does not translate in to team wins or team profitability. Hill and Groothuis (11) examined the NBA collective bargaining agreement (CBA). Specifically, the authors focused on the redistribution of rents from the superstars back to the median voters (players). They hypothesized that portions of the CBA, such as salary caps, were designed to improve the distribution of salaries in the NBA. The results of their study revealed “that skewed salary distributions may lead to CBAs that redistribute the rents from the rich (superstars) to the poor (median voters)” (p. 19). By examining the CBA, Groothuis and Hill take a macro approach to examine salaries. On the other hand, the focus of this study was on the micro components which in this case are inputs such as player statistical performance as a means of determining salary. Yang and Lin (28) examined the determinants of salaries for NBA players. Their goal was twofold (1) to determine if discrimination based on a player’s nationality and (2) to determine if the market size of international players’ home countries impacts their compensation. They examined salary data from 618 NBA players between 1999-2000 and 2007-2008. Findings from their study suggested that international players seem to receive a lower salary than that of theU.S.-born players. Moreover, they also found that international players from large markets “received preferential labor market treatment.” To this end, the researcher’s hypotheses of salary discrimination by nationality and home country market size was confirmed. Furthermore, the authors stated that player demographics such as height, position, draft order, and a team’s local market size play vital roles in determining players’ salaries. The focus of Yang and Lin’s investigation did not consider on the court performance. Instead non-performance variables such as height and race were considered. Groothuis and Hill (9) examined NBA pay discrimination as it related to race. Specifically, they stated that the economic literature classifies racial discrimination based on two factors: exit discrimination and wage discrimination. The authors tested for both types of discrimination in the NBA. Using 1990-2008 NBA data, the authors did not find any evidence of wage discrimination or exit discrimination. However, there did exist a pay premium paid to White players during their career of 16%–20%. The authors did note, however, this finding as interesting as it was not as “robust” in the overall model to contribute to pay discrimination. We recognize that there have been other researchers who have investigated salary discrimination in other professional sports. The following is a sample of the work that has been conducted regarding professional athlete salaries. Kuethe and Motamed’s (16) study on Major League Soccer’s (MLS) wage determination found that superstars in the MLS earn a premium over and above that of other players. Kruatmann and Oppenheimer (15) examined wage differential in Major League Baseball (MLB) free agent salaries. Specifically, they were interested in salary dispersion among free agents and length of negotiated contract. Their results indicated that there seemed to be some type of undetectable “trade-off” occurring in the negotiation process on compensating wage differentials. In a follow up to the Kruatmann and Oppenheimer study, Link and Yosifov (17) also examined wage differential in MLB free agent salaries. Results from their study indicated that MLB free agent position players were willing to forego monetary gains in exchange for a long-term contract. Vincent and Eastman (27) utilized the quantile regression approach to determine pay of forwards and defensemen in the National Hockey League (NHL). In addition, they used explanatory variables such as height, weight, career games played, team revenue and draft position that took on a holistic approach to understanding salaries. Using Mincer’s earnings equation, they found that the explanatory power of that equation is lower for low-paid players as opposed to higher paid players.Keefer (14) applied quantile regression analysis to determine compensation discrimination among National Football League (NFL) linebackers and did find considerable evidence that salary discrimination is present in the linebacker market. Mondello and Maxcy (21) examined salary dispersion and incentive pay on NFL team performance. Findings from their study revealed that there was a correlation between improved on-field performance and increased payroll and lower levels of salary dispersion. The 2013-2014 salaries of 243 NBA players were utilized for this study. Excluded were the salaries of rookies and those players who were still playing under their rookie contract (22). The rationale was that these player’s salaries are constrained by the rookie salary cap which is typically in force for three years. So if a rookie or a second year player performed well statistically, they would not be compensated accordingly because they are “locked” into a contract that may not reward them for their excellent play. A multiple regression analysis was utilized to analyze the salary data. The average player age was 25.8 years and the average years of experience was 8.3 years. Table 1 highlights the descriptive statistics regarding the salary and the independent variables. The dependent variable for this study was NBA player salaries and the independent variables were the ten offensive and defensive statistical categories. We chose the ten independent variables because unlike other sports such as football where a player is paid to play either offense or defense, a basketball player is paid to play both offense and defense which is the nature of the game. As a result, an NBA player’s monetary value is based on metrics that are similar and equitable to his teammates. The multiple regression analysis was conducted to determine which explanatory variables were predictors of NBA player salaries. We screened the data to determine if multicollinearity existed among our chosen explanatory variables. Key indicators that measure multicollinearity are tolerance and the variance inflation factor (VIF). Tolerance values that are less than .1 suggest that multicollinearity exists (19, 23). In the same vein, VIF values that are greater than 10 signify the presence of multicollienarity among explanatory variables (19, 23, 26). Our screening of the data revealed that multicollinearity did exist in regards to the turnover variable which had a tolerance and a VIF value of .093 and 10.764 respectively (Table 2). In terms of treatment of such variable, Mertler and Vannatta (19) suggest that the variable be eliminated from the analysis. To this end, we chose to follow the suggestion of Mertler and Vannatta and eliminate the turnover variable. The hypothesis posited that scoring components would significantly determine the level of compensation for NBA players. The R square and adjusted R square were .629 and .613 respectively. Also, the F-statistic of 39.37 indicated that at least one of the independent variables was significant at the .05 level. The hypothesis was partially substantiated. Field goal percentage and points per game proved to be the most statistically significant variables in determining player salary, however, rebounds, fouls, and assists were significant contributors as well. 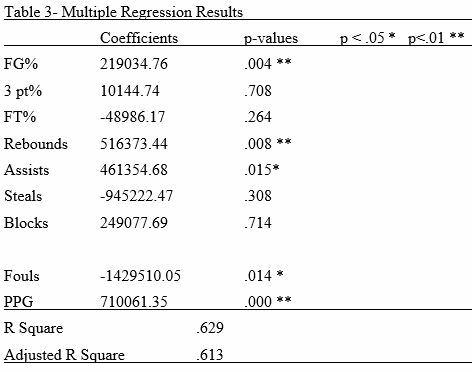 The other variables were not statistically significant at either the .05 or .01 levels (Table 3). The findings were similar to those of Berri, Brook, and Schmidt (2). They too examined the variables that determine NBA player salary and found that points per game and rebounds were significant contributors. However, their study also found that blocked shots were significant. The focus on a non-scoring variable such as rebounds may signify a departure from the “let’s pay for scorers” mentality and practice that NBA teams seem to employ. The purpose for this study was to identify the variables that were most likely to contribute to NBA player salaries. We found that points per game and field goal percentage were the two main contributors to player salary. In other words, not only is it beneficial that a player have a high scoring average, but he must also shoot effectively as well. Moreover, rebounds, assists, and personal fouls were statistically significant. In regards to assists, teams may be focusing on a player’s ability to contribute to scoring. Additionally, in the case of rebounds, a player’s value can be enhanced if he is able to either prevent the opponent from another scoring chance by grabbing defensive rebounds and conversely, providing additional scoring chances for his team by grabbing offensive rebounds. Fouls were also found to be a significant contributor in this study. A player who has an excessive amount of fouls gives his opponent the opportunity to score and thus he becomes a liability to his team. On the other hand, a player who does not accumulate fouls is definitely an asset to his team. With the burgeoning field of sport analytics, teams are focusing on a multitude of metrics and developing formulas to determine player efficiency. This practice in theory should influence NBA team management decisions when it comes to determining player salary. Again, as stated earlier, this may signal a change in thinking among NBA front office personnel whereby they put more of an emphasis on non-scoring metrics in addition to scoring metrics to develop formulas and models that will lead to better and more pragmatic methods of compensating players. Berri, D. J., Brook, S. L., Schmidt, M. B. (2007). Does one simply need to score to score? International Journal of Sport Finance, 2 (4) 190-205. Byrd, W. J., Mixon, P. A., & Wright, A. (2013). Compensation of college football’s head coaches: A case study in firm size’s effects on pay. International Journal of Sport Finance, 8 (3) 224-235. Eastman, B. & Vincent, C. (2009). Determinants of pay in the nhl: A quantile regression approach. Journal of Sports Economics, 10 (3) 256-277. Grant, R. R., Leadley, J. C., & Z. X., Zygmont (2013). Just win baby? Determinants of ncaa football bowl subdivision coaching compensation. International Journal of Sport Finance, 8 (1) 61-74. Groothuis, P. A. & Hill, R. J. (2013). Pay discrimination, exit discrimination or both? Another look at an old issue using nba data, Journal of Sport Economics, 14 (2) 171-185. Hill, R. J., and Groothuis, P. A. (2001). The new nba collective bargaining agreement the median voter model, and a robin hood rent redistribution. Journal of Sports Economics, 2 (2) 131-144. Holbrook, M. B. & Schultz, C. J. (1996). An updating contract length and the return to performance in major league baseball.Journal of Sport Management, 10 (2) 131-148. Keefer, Q. A. W. (2011). Compensation discrimination for defensive players: Applying quantile regression to the national football league market for linebackers. Journal of Sport Economics, 14 (1) 23-44. Krautmann, A. C., & Oppenheimer, M. (2002). Contract length and the return to performance in major league baseball. Journal of Sports Economics 3 (1) 6–17. Kuethe, T. H., & Motamed, M. (2010). Returns to stardom: Evidence from u.s. major league soccer. Journal of Sport Economics, 11 (5) 567-579. Link, C. R., & Martin, Y. (2011). Contract lengths and salaries: Compensating wage differentials major league baseball. Journal of Sport Economics, 13 (1) 3-19. Marburger, D. R. (2003). Does the assignment of property rights encourage or discourage shirking? : evidence from major league baseball. Journal of Sports Economics, 4 (1) 19-34. Mertler, C. A. & Vannatta, R. A. (2005). Advanced and multivariate statistical methods: Practical application and Interpretation (3rd ed.). Glendale, CA: Pyrczak Publishing. Michaelides, M. (2010). A new test of compensating differences: Evidence on the importance of unobserved heterogeneity. Journal of Sport Economics 11 (5), 475-495. Mondello, M., & Maxcy, J. (2009). The impact of salary dispersion and performance bonuses in nfl organizations. Management Decision, 47 (1) 110 – 123. Pallant, J. (2013). SPSS survival guide: A step by step guide to data analysis using ibm spss (5th ed.). New York, NY: Open University Press. Stevens, J. (1996). Applied multivariate statistics for the social sciences (3rd ed.). Lawrence Erlbaum: Mahway, NJ. Vincent, C., & Eastman, B. (2009). Determinants of pay in the nhl: A quantile regression approach. Journal of Sport Economics, 10 (3) 256-277. Yang, C. & Lin, H (2010). Is there salary discrimination by nationality in the nba? Foreign talent or foreign market. Journal of Sports Economics, 13 (1) 53-75.